It is always crucial to battle for a table that meets your expectations. Among the many found in the market, the Double Fish 19mm 2.5 Inch is a world-class brand. The technology applied in building this ping pong table is at another level. It meets the standards outlined by the International Table Tennis Federation, ITTF and has been used in global competitions for a long time. It is also used in significant table tennis events. It is a tool that has stood the test of time. The tournament-quality of Double Fish 19mm 2.5 Inch is evident. Besides its competition-grade standard size, the table comes with professional balls, bats, and net system. For many tables, such accessories are gotten separately. As such, purchasing this table saves you money and time. It is both an indoor and outdoor table. It is thus convenient to use in homes, sports clubs, recreation centers, schools, offices and community centers. Being an international brand is an added advantage. All of us like equipment that meets established regulations. Being a global championship sponsor and approved by ITTF, The Double Fish 19mm 2.5 Inch is a perfect brand for various domestic and cross-border events. The top technology used in creating the table is unique. With this table, you are guaranteed of a perfect play level. It has a high-density fireboard that measures 19mm. The fiberboard panel has a German curtain coating technology. You enjoy an excellent performance with elasticity, glaze and perfect friction. Storage is effortless. The table halves can be rolled using lockable casters. Also, it has a playback feature for single playing. The Double Fish 19mm 2.5 Inch has a playing surface that is 2.5 inches in thickness, the closest grade to the global competition standards. The flexibility displayed by this table takes your play to the next level. You experience a different experience when using it. Sometimes we get frustrated when what we purchase gets damaged or becomes unusable after a short while. This is not the case with Double Fish 19mm 2.5 Inch. It is environmentally friendly and also lasts for a long time. The table is created using Formaldehyde free materials. Also, no toxic gas is emitted by the equipment. Your health is assured. With a weight of 110 Kg, the table is massive to shift or lift. However, it has a wheel-base that, measures 40mm. Also, the presence of 8 lockable wheels enhances stability and helps in moving the table around. The table is 95% pre-assembled, meaning that setting it up is a hassle-free process. The process requires you just to use several bolts to attach the table. There is no particular expertise needed to set up the table. Double Fish 19MM 2.5 Inch table offers nothing else but satisfaction. Previous users praise it for its quality, stability, durability and efficient playing surface. Having stood the test of time, this table offers you a different playing experience and does not harm your health or the environment. It is recommendable to all players, beginners, and professionals. 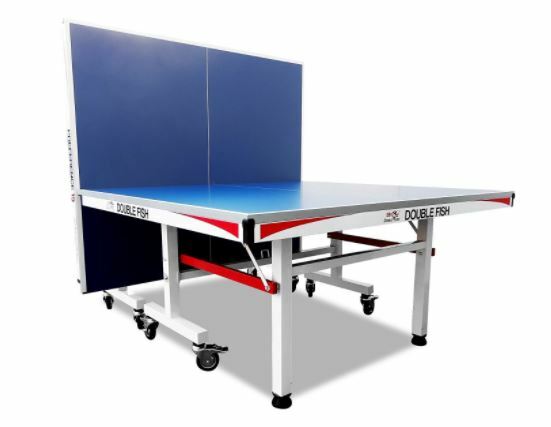 You can read for more indoor table tennis tables reviews to find out more if this Double Fish is not your ideal choice.